Charming and comfortable the Silverton Inn and Suites offers free Wi-Fi and a daily breakfast buffet near The Oregon Garden. 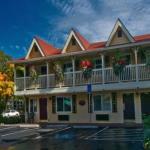 All 18 rooms at the two-story Silverton Inn and Suites have cable TV free Wi-Fi access and coffeemakers. Suites feature fully equipped kitchens and dining areas. Non-smoking rooms are available. Enjoy the breakfast buffet and check with the front desk about scheduling a massage on site. The business center offers fax and photocopying services. Pets are welcome with restrictions and fees. Parking is free. Located off Highway 213 in the heart of historic downtown Silverton the Silverton Inn is about a mile from The Oregon Garden a popular tourist attraction. The Gordon House Conservatory designed by Frank Lloyd Wright is a little more than a mile from the hotel. Visit East Valley Wineries for tours and tastings five miles away. The Portland International Airport is 45 miles from this location.